How is it that a once-common bird can decline so steadily? Each year, the plaintive song of the Eastern Wood-Pewee carries through the forests of eastern North America. For the past 25 years, the number of Wood-Pewees has fallen. But providing economic incentives for private landowners to save forests can help. So can enacting policies that promote smart growth and curb urban sprawl. Be sure to let your elected representatives know you care about these issues! Sign up for Weekly Preview email. An Eastern Wood-Pewee perches inconspicuously in the shady interior of the forest. Inconspicuous, that is, until it sallies out to catch a flying insect. [fly] Or until it offers up that unmistakable song. But for the past 25 years, the number of Eastern Wood-Pewees has fallen, across much of the bird’s range. How is it that even a once-common bird can decline so steadily? Fragmentation of forests into ever smaller tracts, as well as forest disturbance — such as heavy browsing by overabundant White-tailed Deer — are part of the problem. So is the loss of forest in the bird’s South American winter range. 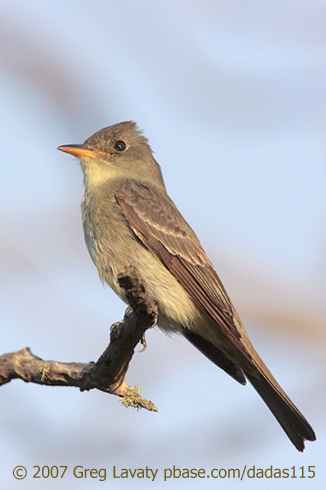 As a result, the Eastern Wood-Pewee is now a species of high conservation concern. What practices can help stem the decline of Eastern Wood-Pewees and other forest birds? Well, providing economic incentives for private landowners who save forests is one. Enacting policies that promote smart growth and curb urban sprawl is another. To receive a weekly preview of the week ahead on BirdNote — and the most colorful email you’ll receive all week — sign up at BirdNote.org. Call of the Eastern Wood-Pewee provided by The Macaulay Library at the Cornell Lab of Ornithology, Ithaca, New York and recorded by G.A. Keller LNS 73930. The fly was recorded by G.F. Budney. Let your elected representatives know you support habitat for birds!